The Blue Ridge Mountains are one of the best-known mountain ranges in the eastern part of North America. Their stunning beauty and unique color has made them the subject of art of all types, from paintings and drawings to music and movies. If you live in Western North Carolina, you are lucky enough to call this place home and enjoy the incredible views that are provided by this range. If you own property in a Grandview Peaks community, you’ll enjoy these views on a daily basis. We couldn’t be more proud of the location we are offering our clients and want you to understand just how special it really is. This is a mountain range of legend. Here are some common questions and answers about the Blue Ridge Mountains. Are the Blue Ridge Mountains blue? Yes and no. The mountains themselves are not blue, but they show a blue haze that occurs due to the way your eye observes a dark, solid object. When viewed from a distance, the light scatters across the mountains and the isoprene released into the atmosphere by its thick vegetation to create a blue haze. What states are the Blue Ridge Mountains in? The Blue Ridge Mountains span Pennsylvania, Maryland, Virginia, North Carolina, South Carolina and Georgia. This particular segment of the Appalachian mountains is 615 miles long. How high are the Blue Ridge Mountains? The Blue Ridge Mountains have the highest mountains the eastern half of North America south of Baffin Island. The highest peak is 6,684 feet at Mount Mitchell, located in North Carolina. 39 of the peaks are over 6,000 feet. The average elevation for most of the mountain range is 2,000 to 4,000 feet. How many national parks are in the Blue Ridge Mountains? The mountain range includes Shenandoah National Park and the Great Smoky Mountains National Park. 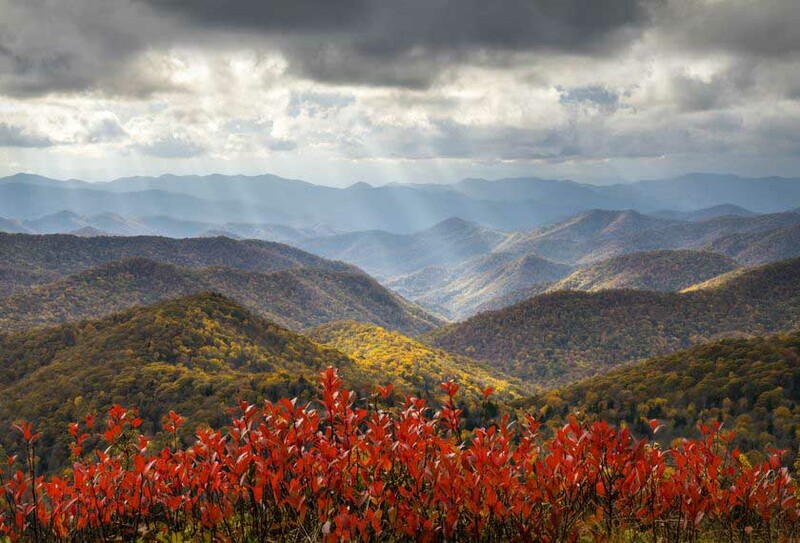 It’s also home to the Blue Ridge Parkway, a scenic motor route that takes in some of the best vistas of the range. How did the Blue Ridge Mountains get their name? The Blue Ridge Mountains are named for their apparent blue color. The name likely came from early pioneers when the mountain range became an important dividing line between colonial territory and Native American territory. What is the Blue Ridge Mountain song? The Blue Ridge Mountain Song is a song written by Alan Jackson and published in The Bluegrass Album. The song tells of a tragic love affair between a young man and a young woman, who marry while singing a Blue Ridge Mountain song. Tragically the young woman dies, and the grieving husband sings the song in remembrance of his young wife.